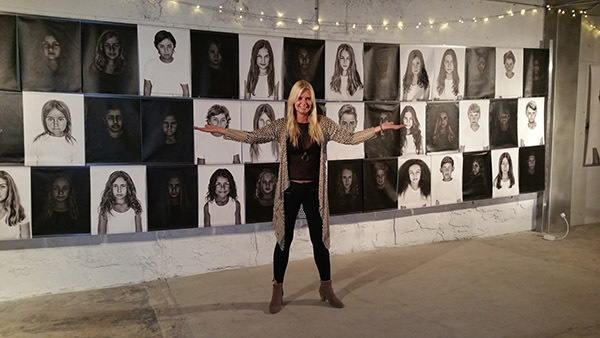 “Faces of the World” (FOTW) Photo Exhibition vernissage kicked off on March 10, 2017 in the rapidly emerging Miami River area in an old fishing warehouse. VIPS fraternized in an outside casual courtyard setting illuminated with string lights and a neon-lit blue boat while sipping Notorious Pink rose, chilled Estrella Damm beer and other libations and Cuban munchies from El Palacio De Los Jugos under the Miami moon. Plenty of Icelandic Glacial water was on hand for the children as well. Oversized children’s black & white portraits were hung in the industrial space in a very minimalistic way adding to the purity of the concept. Many of the parents and some of their “model” children attended throughout the inaugural weekend. . The Faces of the World photographer, Viveca Ljung and partners Cecilie Jorgensen Kay and Shiri Fauer were on hand. Property owner, Kent Kay and his visionary mother, Virginia Kay who first set her sights on the Miami River decades ago came to celebrate. The After Party was held at KIKI on the River, a new Miami hotspot opening soon on another Kay property. “FACES OF THE WORLD” (FOTW) is the brainchild of Swedish natural beauty, Viveca Ljung, a former Miss Sweden and model. Her experience in front of the lense translated to talent behind the camera where she has focused on shooting children. Viveca has crafted a method that combines the best in photography with the best in visual arts and digital sciences. She has been photographing children around the world for over 30 years. For this exhibition, Viveca photographed 180 Miami children. They represent colorful combinations such as Native American/Italian, Latvian/Colombian, Romanian/Turkish, Israeli/Peruvian, Panamanian/German, Serbian/Norwegian, and many many more. Some children featured are offspring of iconic professional athletes from the NBA like Scottie Pippen kids. The concept of the Exhibition is to showcase a collection of professional portraits of children with cultural and ethnic diversity, thus bringing awareness and “tuning-in” on world unity regardless of religion, ethnic or cultural differences. It demonstrates how strength lies in differences, not similarities. FACES OF THE WORLD” debuted at an ideal time when the world needs to embrace diversity and in the ideal place, Miami, a true melting pot. “In Miami especially, there are so many children with mixed nationalities. As a mother, I wanted to share a positive message about our youth and how their pure innocence seems to allow them to all get along beautifully here,” remarked Viveca Ljung. Two other Miami parents, Cecilie Jorgensen Kay and Shiri Fauer, with mixed ethnicity children have collaborated with Ljung to make this Exhibit a reality. Jorgensen Kay is a serial entrepreneur hailing from Norway, studied in Paris and landed in Miami working in hospitality and retail and today holds titles CEO and Mother. She is constantly juggling between overseeing real estate investment assets, restaurants owned within the family and charity work. Fauer was born in Germany of Israeli/Ukraine descent and has blossomed into a top notch hair & makeup artist/stylist for both print and film clients. She has worked on sets with celebrities including Denzel Washington, Michael Bay, Pitbull, Chris Brown and many more. The photographic images of the diversified children were made into oversized prints ranging in size as big as 6 feet by 8 feet. This makes the photos of the exhibition impactful creating a wow factor. All of the images are for sale and parents can also commission photography of their children. FOTW also has a merchandise program. A coffee table book is for sale incorporating the photos and the message of unity through our children as well as t-shirts and caps. A percentage of all sales is going to designated charities including Miami’s Nicklaus Children’s Hospital and Rescue Earth. The FOTW Exhibition will go on world tour. Up next this summer is The Hamptons and Stockholm, Sweden. “FACES OF THE WORLD” message is always timely but especially now in America and the World! HOPE, PEACE, LOVE, DIVERSITY, UNITY!!! THE CHILDREN ARE OUR FUTURE!